The state’s premier training conference for educational leaders is quickly approaching. This year’s theme for Workshop 2018, “Engaging Every Child,” reinforces our belief that every child has a path toward success and that student achievement is directly correlated with effective school board leadership — which begins with effective training. Workshop will offer more than 250 training opportunities starting Monday, Oct. 22 and going through Thursday, Oct. 25. Jointly sponsored by the New Jersey School Boards Association, the New Jersey Association of School Administrators, and the New Jersey Association of School Business Officials, Workshop is an ideal opportunity for board members and other school leaders to refresh their knowledge about vital topics in education and to learn valuable strategies for improving the quality and efficiency of their local district. Workshop will offer an abundance of information on best practices, free programming and resources, and successful public/private collaborations. This year, the Workshop group registration covers 20 team members (up from 18 team members) which may include the school board, business administrator, superintendent, facilities managers, curriculum professionals, IT staff, and other district professionals. So whatever your interest — technology, cost savings, shared services, sustainability, alternative revenue opportunities, teacher evaluations, student achievement — you’re sure to find it at Workshop 2018 at the Atlantic City Convention Center. The Exhibit Floor will be open on Tuesday, Oct. 23 and Wednesday, Oct. 24; while Action Labs, Group Sessions, and Special Sessions will be offered on all four days. Read on for some highlights of Workshop 2018. 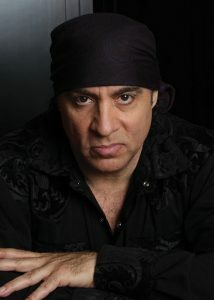 NJSBA is pleased to announce that this year’s keynote speaker is Steven Van Zandt (“Little Steven”). Van Zandt is best known as an influential member of Bruce Springsteen’s E Street Band and for his portrayal of Silvio Dante in HBO’s The Sopranos. Van Zandt was a member of Springsteen’s early bands, joining the E Street Band in 1975. He worked closely with Springsteen, co-producing The River and Born in the U.S.A., while also producing and writing material for Southside Johnny and Gary U.S. Bonds. In 1982, he branched out as Little Steven & the Disciples of Soul. Although he officially left the E Street Band in 1984, he rejoined it in 1999 and was inducted into the Rock and Roll Hall of Fame as an E Street Band member in 2014. But Van Zandt has also long had an interest in and passion for education. Building on his many years in the music business, Steven Van Zandt has spent nearly a decade working with a team of educators to create a history of Rock and Roll curriculum, with interdisciplinary lessons featuring the legendary musicians who are at the heart of the story. This project, TeachRock offers free curriculum and educational materials to schools and teachers. Recent TeachRock project collaborations include Ron Howard’s The Beatles: Eight Days A Week documentary, and the critically acclaimed PBS Soundbreaking series. Both have contributed to the vast collection of standards-aligned, popular music-based lesson plans housed at teachrock.org. The foundation’s materials represent diverse perspectives on American culture appropriate for social studies, history, language arts, general music, and even science classrooms. The TeachRock team works closely with educators across the country and the curriculum is frequently updated, with new resources and lessons being created and added to the website on a regular basis. “[Little Steven’s] TeachRock program brings an essential curriculum of music and culture into school and makes it available at no cost to educators. In a time of cutbacks in arts funding, Steve’s programs are keeping kids engaged in the arts, and in school — this is his greatest legacy.” stated Bruce Springsteen as he inducted Steven Van Zandt into the New Jersey Hall of Fame on May 6, 2018. The Rock and Roll Forever Foundation sponsors professional development events for teachers using the TeachRock curriculum, promotes the project on a national scale, and, through its partners Scholastic, Inc., the National Council for the Social Studies (NCSS), and the National Association for Music Education (NAfME), communicates with middle and high school teachers nationwide. “Music will forever be humanity’s most effective and consistent source of inspiration and motivation, and, we have learned, music turns out to be our most solid common ground for establishing communication between teachers and students which is where education begins,” said Steven Van Zandt. The main focus of Workshop is training. There are several program formats that appeal to different learning styles. Whether you enjoy listening to expert speakers in a large group setting, want short informational sessions that focus on specific topics, or prefer being part of a small group participating in hands-on activities, Workshop 2018 has every option for you to learn at your pace. Last year, NJSBA added a day of leadership and New Board Member Orientation training on the Monday of Workshop week, which attracted larger-than-expected attendance, and garnered glowing reviews from attendees. So this year, the Association has added more sessions; we urge you to attend the Monday sessions. Action Labs Action Labs are structured to not only teach attendees best practices, but also provide the opportunity to put those theories into practice. These 90-minute sessions will be offered all four days of Workshop and provide attendees with in-depth learning and engaging activities. They are held in the convention center’s small group rooms, and attendance is limited to 48 participants in order to allow for a highly interactive, hands-on session. Seating is available 30 minutes before the session starts, on a first-come basis. Board members can earn one NJSBA Board Member Academy credit for each Action Lab they attend. This year’s Action Labs address a wide range of topics including leadership, board governance, school finance, superintendent search and labor relations, health and wellness, strategic planning, the chief school administrator evaluation process, teamwork and student achievement. Collaboration with the New Jersey Department of Education Once again, Workshop will feature a training collaboration with the New Jersey Department of Education. NJDOE staff members will be presenting programs on several topics that are especially timely and useful to school leaders. Topics include focusing support on the cycle of teaching and learning; processing data to increase student learning; and school security and safety. Group Sessions Group Sessions are 60 minutes in length, take place in a lecture hall setting, and often feature a panel of experts or multiple presenters. Among this year’s Group Sessions are programs within the following tracks: technology, student achievement/learning, finance, alternative funding, governmental relations, curriculum, legal, policy, shared services, school safety, leadership, board governance, anti-bullying and professional development. Learning Labs Special sessions will be offered at various Learning Labs throughout the Exhibit Floor. Learning Labs provide an introduction to a topic of study and offer participants the chance to decide if they want to dive deeper into training. These sessions are 30 minutes long, content-focused, and less formal than the Group Sessions or Special Sessions. There will also be Learning Labs after the Mock Board session, to allow for further discussion of legal questions that arise during that program. The Learning Lab setting will offer a wide variety of topics and give participants the opportunity to learn and ask questions in a casual setting. Mandated Training Workshop 2018 will offer the opportunity for school board members and charter school trustees in their first, second and third years of office, as well as members in the first year of a reappointed/re-elected term, to fulfill their state-mandated training requirements. These in-person sessions will provide the type of interactive training that adds richness to the board member-trainer conversation. Governance I will be offered Monday, Oct. 22 while Governance II, III and IV programs will be offered on the morning of Thursday, Oct. 25. Board members are also welcome to take their 2019 mandated training at Workshop, in advance of the 2019 calendar year. Special Programs Is your district preparing for negotiations? Are you a member who sits on his or her board’s negotiations committee? Join us at the Labor Relations Mini-Workshop. This half-day program updates board members and administrators on a variety of labor relations topics, including recent court decisions regarding increments and developments in health insurance. The session is an important learning and networking opportunity for anyone involved in collective negotiations. Come hear an experienced panel of practitioners provide practical information and advice on current negotiations topics. This popular session usually fills up fast. We recommend arriving early. Check the program book and app for the session location and to schedule your day. The 48th Annual School Law Forum, another long-time favorite of Workshop participants, will take place at Workshop on Thursday, Oct. 25. The program is a full-day review of timely legal issues, and is designed for school law attorneys, board members and administrators. Separate registration is required for the School Law Forum. Mock Board The popular “Mock Board” will return to the Investors Bank Theater on Wednesday, Oct. 24 at 1 p.m. After the presentation, participating attorneys will move from the Investors Bank Theater to the Exhibit Floor Learning Lab locations for the Legal Clinics, in-depth discussions of legal issues in more intimate 30-minute sessions, which will be presented twice during an hour-long period. Professional Development Credit Workshop 2018 will offer board members the opportunity to earn NJSBA Academy credits toward board member certifications. In addition, NJSBA has been authorized to issue Qualified Purchasing Agent (QPA) credits for School Business Administrators, professional development credits for Certified Educational Facilities Managers (CEFM) and sustainability credits toward Sustainable Jersey for Schools Certification. Courses will be offered for those interested in increasing their knowledge of public purchasing, as well as public officials who want the Registered Public Purchasing Official (RPPO) or the Registered Public Purchasing Specialist (RPPS) certification. Business administrators, facility managers and administrators are welcome. Please check your Workshop program book or SCHED, Workshop 2018’s web-based event scheduling program, for a listing of specific programs that satisfy certification requirements. Workshop 2018 will also offer expanded training for school technology professionals, as part of NJSBA’s commitment to helping schools reach their technology goals, such as the Future Ready program. Programming that meets the qualifications for these credits and certifications will be noted in the program book and in the Workshop 2018 app. Exhibit Hall The Exhibit Hall at the convention center will be open from 9 a.m. to 4 p.m. on Tuesday, and from 9 a.m. to 4 p.m. on Wednesday. With more than 300 exhibitors, the hall provides an easy forum for learning about the latest in educational products and services. NJSBA Services Area: One Stop Shop for Savings How much can your district save by using NJSBA services? Stop by the NJSBA Services area to talk with a professional on how your district can save thousands of dollars a year with the help of NJSBA. Learn about the products, services, and cost-savings opportunities for your district that comes with membership in NJSBA. The NJSBA Services area is also the destination for Workshop ribbons and giveaways. Sonic Highways Hometown Documentaries Film Festival NJSBA has teamed up with Steven Van Zandt’s Rock and Roll Forever Foundation to produce the Sonic Highways Hometown Documentaries Film Festival, to be held at Workshop 2018. Students are encouraged to dig deep into the sounds of their hometowns with this dynamic, hands-on exploration of local history through music. Sonic Highways Hometown Documentaries is a project-based learning initiative, created by the Rock and Roll Forever Foundation, that empowers groups of students to create a filmed portrait of their town’s musical history through research in libraries and archives, interviews with family members, local musicians, venue owners, historians, and fans. The Sonic Highways Hometown Documentaries Film Festival will take place on the Exhibit Floor Oct. 23 and 24. Participating students will have the opportunity to screen their films at the festival and participate in a question-and-answer session with attendees. NJSBA Future Ready–NJ Center NJSBA’s Future Ready-NJ Center will offer attendees professional development opportunities throughout the conference in alignment with the Future Ready initiative. This unique area on the exhibit floor will highlight the schools in New Jersey that have earned certification. Do not miss this opportunity to celebrate and learn from New Jersey schools that have dedicated themselves to best prepare our students for success in college, career, and citizenship in a digital age. The Future Ready–NJ Center will also offer the opportunity for districts to learn how to achieve the certification with the help of NJSBA service providers. Innovative Classroom- Powered by SHI Public school classrooms today are designed to place a premium on interaction, collaboration and engagement, and provide educational opportunities that were never possible before. The 21st Century Classroom at NJSBA Workshop 2018 will demonstrate how technologies and techniques come together to provide maximum educational value to students. The classroom is designed to facilitate initiatives like bring your own device (BYOD), SmartBoards, distance and integrated video learning, and enhanced collaboration. This working model 21st Century Classroom will demonstrate how technology can integrate with pedagogy to strengthen and reinforce curriculum, enhancing the student’s learning experience. Advanced Technology at the Atlantic City Convention Center Workshop 2018 will have a multi-carrier distributed antenna system that will assure quality, high-speed mobile device coverage for all Workshop attendees. This will include the convention center’s atrium, Exhibit Floor, 45 meeting rooms, and ballroom facilities. Arts at Workshop To emphasize the importance of arts education, and to provide Workshop participants with top-notch entertainment, NJSBA will once again showcase some of the finest student performers in the state. The performance schedule was not available at press time, but will be listed in your program book and will be heard throughout the Exhibit Floor during Workshop. Expanded I-STEAM Green Command Center and STEAM Tank This year’s Workshop will feature an updated I-STEAM Green Command Center. This new and improved destination, located on the Exhibit Floor, will engage attendees like never before. The NJSBA I-STEAM Green Command Center will have demonstration stations that will focus on an integrative approach to STEAM education and provide resources and experts to help schools start or enhance existing I-STEAM programs. The center will feature an expanded “STEAM Tank Challenge” which will host elementary schools (K-6), middle schools, (7-8) and high school (9-12) presentations. Now in its third year, the STEAM Tank Challenge, which will be held Oct. 23-24, has grown quickly. This year, 410 teams entered the regional competitions, and 90 have been invited to present at Workshop during the competition finals. This reprised Workshop feature will challenge teams from school districts to invent something new, modify an existing product, or identify a situation or problem that needs resolution. The design or solution will be judged in a similar format to Shark Tank; and contestants must follow a set of rules and guidelines if the challenge is accepted. Sustainable Jersey for Schools Center The Sustainable Jersey for Schools Center will feature numerous ways schools can engage in sustainability practices. The center will also offer an opportunity to learn more about Sustainable Jersey for Schools certification process. For the fifth consecutive year, Workshop 2018 will be a carbon-neutral event. In an effort to mitigate the greenhouse gas emissions generated to meet the needs of the conference, the three host organizations invest in offsetting the carbon footprint. Such a process involves making a donation that pays for reducing carbon emissions in the atmosphere elsewhere — such as a renewable energy or reforestation project — to balance out the emissions created. Workshop 2018: Engaging Every Child As New Jersey’s students prepare for higher education and 21st century careers, the leaders who govern their schools must also engage in a continuous cycle of professional development and learning. Workshop 2018 will provide board members, charter school trustees and school administrators with the training and resources to help their students thrive in the years ahead. So join us, Oct. 22 to Oct. 25, at the Atlantic City Convention Center for Workshop 2018. For more on the conference, including housing and registration information, go to the Workshop website at. Michael Kvidahl is marketing coordinator at NJSBA.